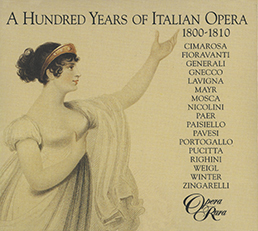 The first volume in Opera Rara’s survey of Italian opera composers of the 19th century features Paisiello, Mayr, Pucitta, Cimarosa, Zingarelli, Paer, Nicolini, Winter, Mosca and others. Yvonne Kenny, Eiddwen Harrhy, Della Jones, Keith Lewis, Diana Montague and others. 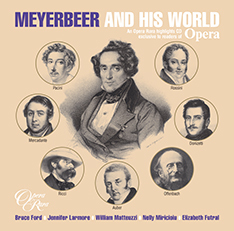 Geoffrey Mitchell Choir, Philharmonia Orchestra, David Parry - conductor. 07 La selva incantata e Gerusalemme liberata, Act II: Aria: Un cenno mi chiedi? 18 La morte di Semiramide, Act I: Recitative and Aria: Sconsigliata ? ! ? Son Regina! 19 Hoango, Act II: Duet: Come potro resistere?